Many times, no matter which antivirus or antimalware solution we use, threats still manage to somehow get onto our computers. Many antivirus software makers offer free online virus/malware scanners that work to varying degrees of efficiency. Many will find the threats, but not all will also remove them. 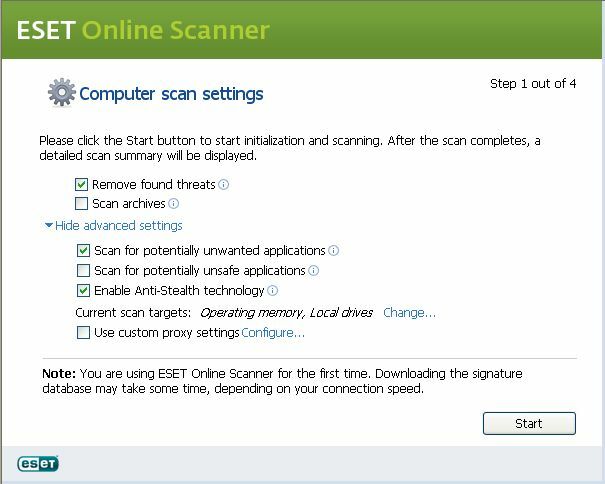 I have found one by ESET that does a very thorough job of finding and removing virus and malware threats from your computer. You can find their online scanner here. If you use Internet Explorer to run the online scan, you will need to install an Activex control that will allow it to run. After the Activex control is installed, it will ask if you want to install the program. Click "yes". Then, there will be a box that appears that will give you options to enable. Be sure that the ones shown checked in the screenshot below are checked before you proceed. You also have the options of having the scan include "Scan archives" and/or "Scan for potentially unsafe applications". Now, go watch a movie, your favorite tv show or read a book while the database loads, and the scan runs, as it will take some time for it to complete﻿. 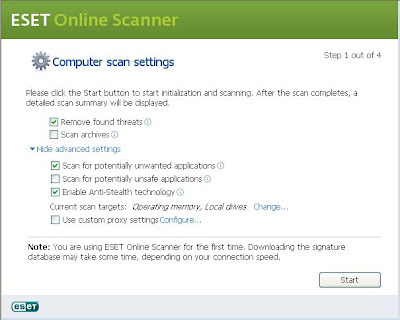 Please keep in mind, that this online scanner is a good supplement to, and not a replacement for a full time antivirus/antimalware program that protects and runs in realtime. It is just good for your online peace of mind as regards your web safety.